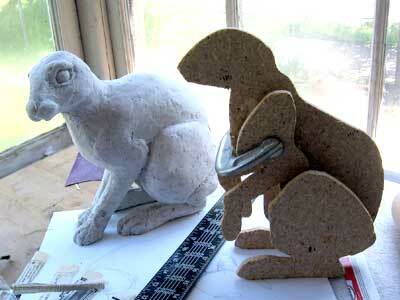 This pair of jackrabbits are made over a solid pressboard armature, and are finished with natural pigments. They are almost lifesized. The huge ears of the jackrabbits were a real challenge – I took a lot of time to make sure they were very firmly attached and strong enough to stand up to a reasonable amount of handling, without making them look unnaturally heavy. When I finished sculpting the faces on this pair of jackrabbits I noticed that the one sitting up appeared to have a more feminine expression than the other hare. I tried to accent the differences by making the “girl” a lighter color than her mate. These desert hares are my first attempt to work on more than one paper mache sculpture at a time – something I need to do more often. My paper mache/mixed media sculptures need to dry completely between every step, so it takes many days for a project to be done – but that leaves many hours in every day when I could be working on another sculpture. I learn something new with every paper mache animal sculpture I make, so it stands to reason that I will learn even faster if I make more sculptures. That’s one of the theories behind the painting a day movement, which my daughter is involved in. Except for the material I used to make the armature, the jackrabbits were made using the techniques shown in detail in the paper mache panda post. 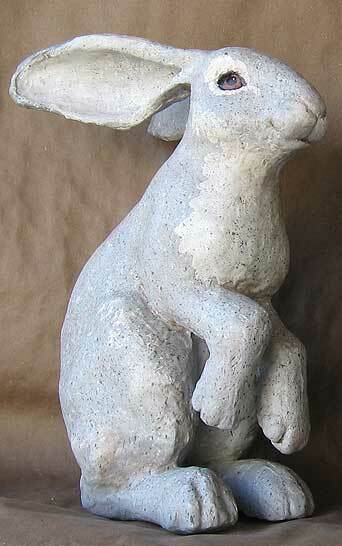 I am currently working in paper pulp for my papier mache sculptures. I try to smooth the wet pulp as smoothly as possible but I find I have to do some sanding when it dries. It is very hard to sand. Is there another way to get the surfaces smoother before it dries so that I don’t have to do as much sanding? I’ve almost come to accept the rough surface as the look I get with this medium. Hi Mary. I don’t work with paper pulp, but one trick that works well with my paper mache clay is to use a mixture of white glue and water to wet a tool or a gloved hand. It makes the tool slick so it can slide over the surface of the pm clay and make it much smoother. I have no idea if it would work with your sculptures, though. I hate sanding, too, so I rarely do it if I don’t have to. You might also try using the DIY gesso recipe on this site. It’s just drywall joint compound and glue, but it’s quite thick and it can be smoothed after it dries with a slightly damp sponge. You can apply several layers to get the sculpture as smooth as you want it. Hi Olivia. 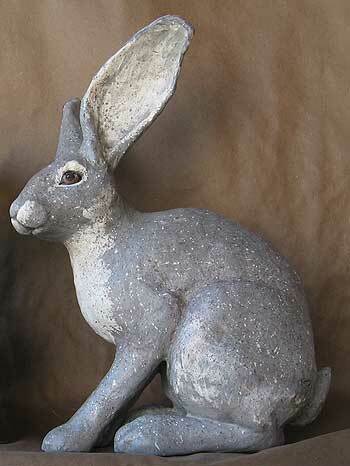 These jackrabbits were made a long time ago, and I didn’t keep the patterns for some reason. Sorry about that. Did you see the jackrabbit “faux trophy mount” 3D pattern? No body, but the head is cute. jackrabbit from you. If this is possible, please tell me how/where/what. P.S. Yes, we have plenty of LIVE JR’s around here…….but I need one that won’t run off. Hi Lola. I don’t have any jackrabbits to sell, I’m afraid. The pair shown on this page went to live in Arizona, I think. I rarely do commissions, so I guess I’m not helping much, am I? Oh these bunnies are the best – good work once again Jonni! Do you use a jigsaw for the wood and how is it connected? Also, do you mache over the completed form? I’m gonna look at the panda post for some more insight. I have been looking for paper mache ideas to use in window displays for my families clock shop. While looking, I found your site. I love the jackrabbits. I think they look fantastic, their color, their texture, the eyes really make them special. Good eyes are so important when working with faces of people or animals. Great job!